Something that I really enjoy doing whenever I’m in Colombia is eating fast food because I really love it. I know that it’s not the healthiest thing to do but I can’t help it because it’s one of the things I enjoy the most whenenver I’m visiting. And something that always caught my attention was their famous Colombian hot dogs because they’re so different to the regular hot dogs we eat here in the US. What makes them unique are the different toppings they add because besides the basic mayo, ketchup and mustard, they also add all kinds of sauces, dressings, cheeses and crazy ingredients like quail eggs, which sadly, I can’t find where I live. I know that a lot of people will probably think that adding all those toppings is just crazy, but that’s exactly what makes these hot dogs so amazingly good. In Colombia, all fast food restaurants and street food vendors come up with all kinds of sauces and dressings to keep more customers coming into their restaurants, their creativity to come up with all those crazy sauces is really amazing and it’s what people love the most. Last year I posted a recipe to make three of the basic fast food sauces you will find in any hot dot stand in Colombia, which are garlic mayo, pink sauce and pineapple sauce. 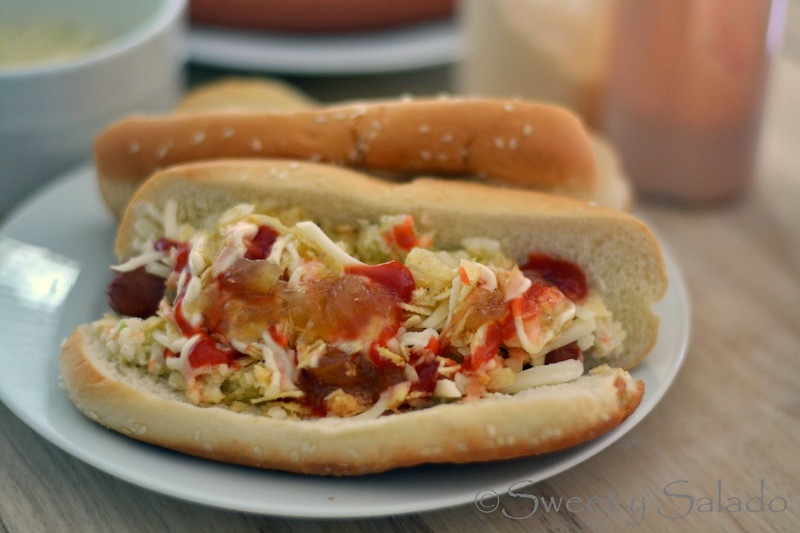 But if you go to the list of recipes I have on the blog you will find a sauces section with more delicious sauces that you can add to your hot dogs such as chimichurri, cilantro lime sauce and Colombian hot sauce, among others. 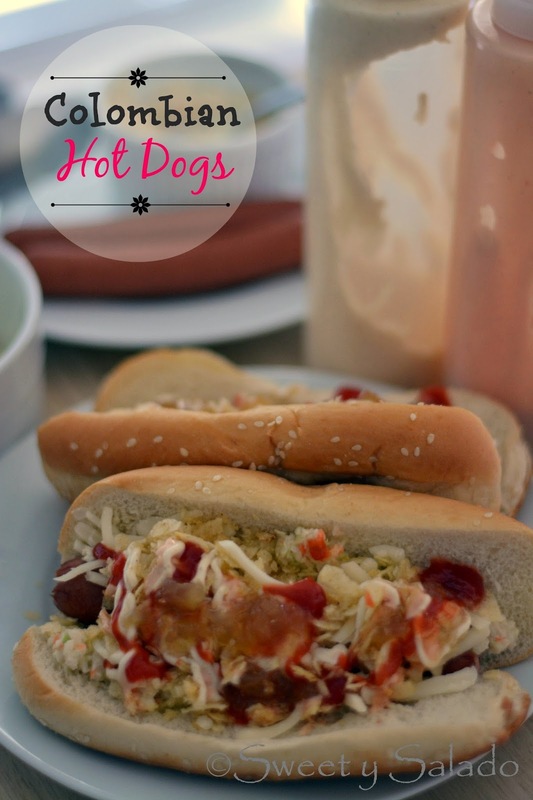 The recipe I’m sharing with you today is a very basic way to make these famous Colombian hot dogs. You can use it as a base to make them more elaborate by adding whatever kind of toppings you want like bacon and quail eggs if you can find them where you live. 1. Cook the hot dogs in boiling water for about 5 minutes or according to package instructions and drain. You can also grill them if you prefer. 2. During the last minute of boiling place a steaming basket over the pot, put the hoagies inside the basket and cover to soften them. 3. To assemble place one hot dog in each bun and add a couple of tablespoons of cole slaw, mozzarella cheese, potato chips and preferred sauces. You can also add bacon, quail eggs and/or any other sauces you prefer.